Yes! Quake Champions is ditching loot boxes for a battle pass | Share It Us! 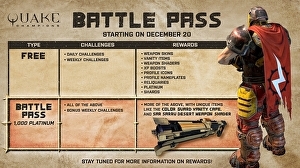 The current system will be ripped out and replaced in a December update, which doesn't appear to have a release date yet, although the battle pass apparently begins 20th December, so presumably the two events will coincide. Instead of earning loot boxes and associated paraphernalia, you'll earn XP for daily and weekly rewards, and this will propel you along a familiar two-tiered line of unlockable rewards - a stingy free line and a generous paid line.